Due to my father’s sophisticated design and unique installation process, and the fact that our product is manufactured right here in North Carolina, LeavesOut Gutter Guards is able to offer competitive pricing for one of the highest-quality products available on the market today. LeavesOut gutter guards fit right over the existing gutters; we also install new gutters with guards if requested by the customer. Additionally, LeavesOut adds flashing under your roof thus preventing wood rot and ice damns with a money back guarantee that our guards will never overshoot whereas our competitors put it in writing that their product may overshoot in the valleys (where 2 roofs meet in a corner) during a heavy rain storm. LeavesOut Gutter Guards will fit on all widths and types of gutters including 5″ to 6″ gutters in aluminum, vinyl, copper and galvanized material. Our guards can be installed not only on standard shingled roofs, but also on cedar shake roofs, metal roofs, slate roofs and on virtually flat roofs to an almost vertical 23/12 pitch. Bottom line; LeavesOut can be installed where other products cannot. We have yet to find a home that we can’t protect 100%. There are 17 points to my father’s patent on the Stainless Steel Hurricane Clips which withstand hurricane winds. In fact, one of our customers had a tornado rip off over half of his roof and LeavesOut Gutter Guards were still attached to the gutters! Most other gutter covers use plastic, PVC or aluminum clips to install their covers; when exposed to UV rays, breakage occurs. Also aluminum attachments once pushed down by ladders, feet, branches, etc., will close the gap for the water to go in. The most critical part of any gutter cover system is the size of the gap between the bottom of the product and top of the gutter. LeavesOut gutter guards use stainless steel clips which are stronger and more durable, and therefore can be spaced further apart. Throughout our 27 years of being in business, my Dad has perfected the gap size and positioning of the clip to handle 12″ of rain an hour, and eliminating the opportunity for debris to catch on the fasteners resulting in no clogs and virtually no maintenance; guaranteed! It remains one of the few products on the market that will allow you to hang Christmas lights after installation! LeavesOut Gutter Guards offers 23 standard colors and over 100 additional custom colors, including copper. We can even exact match any custom color. Our customers have found black to be the least visible and looks like a low profile shadow just above the gutter. We will put up a ladder and let you decide which blends in the best. 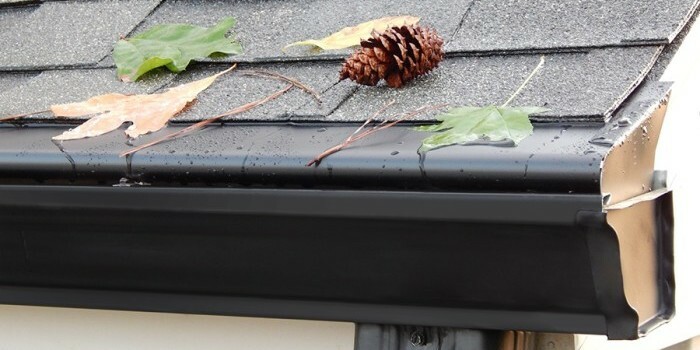 The installation of LeavesOut Gutter Guards will not void the roof warranty. LeavesOut gutter covers are secured to the gutter lip with the material slipped between the 2 bottom layers of shingle. They are not glued, nailed, or screwed to the roofing, as are some other products on the market. When it comes time to re-shingle the roof, LeavesOut gutter covers can be easily removed and reinstalled where other similar products are very difficult to remove and nearly impossible to reinstall and still function properly (ask any roofer.) Each joint is telescoped, or overlapped, thus functioning and looking like one seamless piece. We guarantee that Apex homeowners will be 100% satisfied with our lifetime gutter protection system. LeavesOut gives you the very best performance warranty and money back guarantee! “We were very pleased with our experience with LeavesOut. Ben was very professional and knowledgeable and not only with our estimate, but the installation as well. Would highly recommend!